Ever more integral to Indian success, on Tuesday 6th November, Sathiyan Gnanasekaran was very much the player to attract the attention as proceedings came to a conclusion in the second preliminary round of the Men’s Singles qualification tournament that precedes the Seamaster 2018 ITTF World Tour Platinum Liebherr Austrian Open. He accounted China’s Wang Chuqin, the young man who less than one month ago had won gold in both the Men’s Team and Mixed Team events at the Buenos Aires Youth Olympic Games. Sathiyan Gnanasekaran emerged successful in five games (11-8, 12-14, 11-8, 11-7, 18-16) in what was to prove not the best of rounds for India. Earlier in the top half of the draw, Amalraj Anthony had experienced defeat at the hands of Slovenia’s Bojan Tokic (12-10, 9-11, 11-5, 11-8, 11-4). Later in the lower half of the draw, the same half of the draw as Sathiyan Gnanasekaran, Harmeet Desai lost to Sweden’s Kristian Karlsson (11-5, 11-9, 9-11, 11-9, 11-6). Also, Manav Vikash Thakkar suffered when facing Frenchman, Simon Gauzy (11-9, 11-5, 11-5, 13-11). Disappointments but the greatest for India was the loss experienced by Sharath Kamal Achanta. Presently listed at no.31 on the World Rankings, he was beaten by 21 year old Kohei Sambe, named at no.208 in the global order. Sharath Kamal Achanta suffered in seven games (6-11, 11-5, 7-11, 11-7, 3-11, 11-9, 11-9). Defeat for Sharath Kamal Achanta but amongst the principal names in the lower half of the preliminary round draw, he was the only major casualty. Notably, in addition to Simon Gauzy and Kristian Karlsson, the Korea Republic’s Jeong Sangeun, Jang Woojin, Lim Jonghoon and Jeoung Youngsik all enjoyed success. Jeong Sangeun beat Belgium’s Thibault Darcis (6-11, 11-7, 11-7, 11-8, 7-11, 11-7), Jang Woojin accounted for Mexico’s Marcos Madrid (13-11, 11-6, 11-3, 9-11, 11-9). Similarly, Lim Jonghoon overcame Japan’s Yuto Kizukuri (11-7, 11-6, 11-7, 8-11, 6-11, 11-6), Jeoung Youngsik ended the hopes of Frenchman Tristan Flore in a full distance seven games duel (5-11, 9-11, 11-6, 11-4, 11-9, 9-11, 11-7). 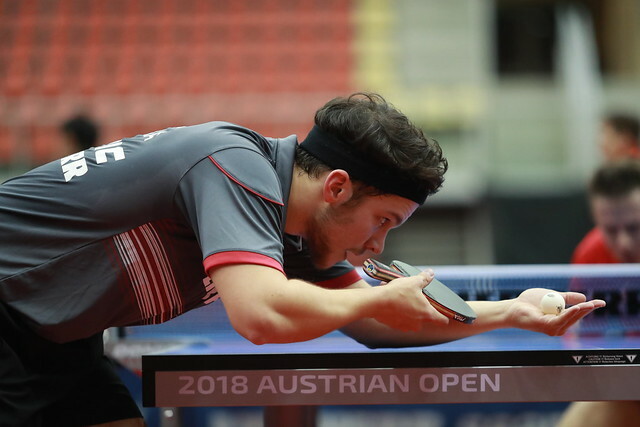 Also in the lower half of the draw, England’s Liam Pitchford beat Frane Kojic, the Croatian being forced to withdraw injured at the end of the fifth game (16-18, 11-6, 11-5, 11-2, w/o); Germany’s Ruwen Filus overcame Hungary’s Tamas Lakatos (13-11, 11-5, 11-5, 11-5), whilst Chinese Taipei’s Chen Chien-An prevailed against China’s Xue Fei (10-12, 11-7, 9-11, 12-10, 11-6, 11-8). Play in the qualification tournament concludes on Wednesday 7th November.